Laparoscopic Gastric Sleeve Plication also referred to as Greater Curvature Plication (GCP), is a bariatric surgery procedure that uses the restrictive technique to achieve weight loss. The surgery, performed laparoscopically (minimally invasive), is very similar to gastric sleeve surgery in the restriction of the stomach. Gastric plication is a less invasive weight loss procedure than the gastric sleeve and RNY gastric bypass – there is no cutting, stapling or bypassing the intestines. Gastric sleeve plication is an experimental procedure that hasn’t been studied to the same extent as gastric bypass or even gastric sleeve surgery. The gastric plication surgery starts with placing the laparoscope and the instruments through small incisions in the abdomen to reach the stomach. The calibration tube is orally passed through the stomach. Non-dissolvable sutures are used to fold the stomach into itself thus allowing a smaller capacity. 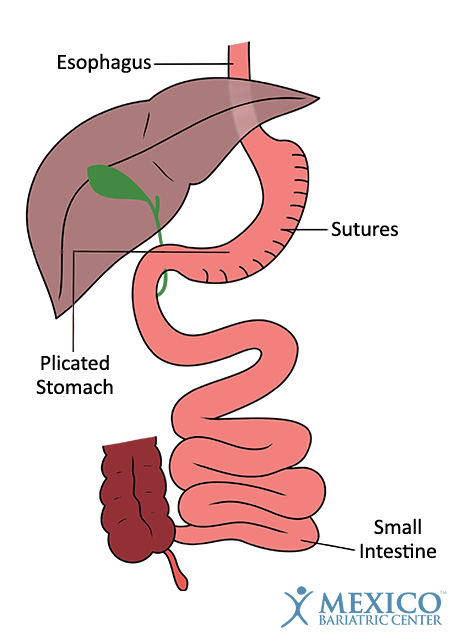 The first folding is performed along the outer edge of the stomach. The second folding reduces the size of the stomach to about 85% of its original size. This reduction in stomach capacity allows patients to feel fuller faster, thus inducing weight loss. First research says there is comparable weight-loss to gastric bypass surgery. Gastric Sleeve Plication does not cut or permanently remove the stomach. One of the most notable disadvantages of gastric sleeve plication is the lack of long-term medical studies. Because sleeve plication is so very new, not much is known about the procedure. Even the reversibility of the process is disputed by surgeons. For most patients, our doctors recommend gastric sleeve surgery (vertical sleeve gastrectomy) because of the similar technique and less unknown regarding the procedure. Contact our staff to learn more about which procedures you are ideal for you. Not all patients are good candidates for gastric plication surgery. Patients need to fall into the lower range of the BMI curve, typically 30 to 40 BMI. Anything higher warrants the need for a more powerful bariatric surgery. Our cost of gastric sleeve plication is typically 1/3 the costs patients face in the United States. Our surgeons have undergone various gastric sleeve plication procedures and can expertly perform this newer procedure. Is Sleeve Plication Surgery Safe? Sleeve Plication is still under investigation, and no long-term data is supporting its effectiveness and complications. Mexico Bariatric Center does NOT offer this procedure it as a viable option. * Prices may rise because of BMI level and previous abdominal surgeries. Last Updated: January 11, 2016, by Ron Elli, Ph.D.